Editor’s Note: Andrew wrote this so we’re posting it as rumors swirl around the Bears QB position. The best way to solve a quarterback problem is through the draft, but nobody has perfected that art. Or even come close. Ron Wolf is probably the best there has ever been at evaluating quarterbacks. He traded a first round pick for Brett Favre, drafted Mark Brunell in the fifth round, Aaron Brooks in the fourth and Matt Hasselback in the sixth. He also drafted Jay Barker, Kyle Wachholtz and Ron McAda. The Patriots hit the jackpot with Tom Brady, but they have a long, long list of quarterbacks who didn’t pan out. The Cowboys wanted Connor Cook and Paxton Lynch over Dak Prescott. For what it’s worth, my favorite quarterbacks the past few years have been Carson Wentz, 2016; Marcus Mariota, 2015; Derek Carr, 2014; EJ Manuel, 2013; Andrew Luck, 2012 and Jake Locker, 2011. What can I say? I like guys who have big arms and can move around. That said, I haven’t spent anywhere near as much time on the quarterbacks in the draft in the past as I have this year. Time will tell if that’s a good thing. 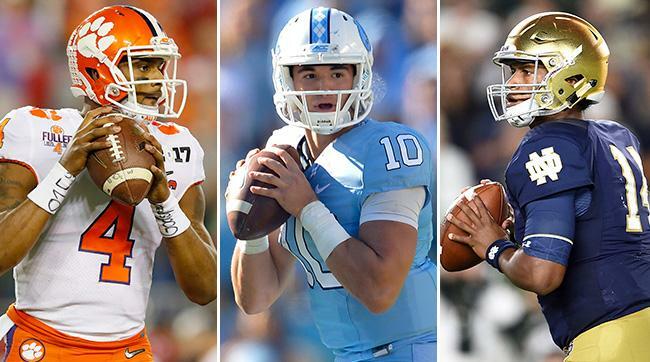 I can say that I like all three of the top quarterbacks more than I liked anybody in the draft last year, but not as much as either Mariota or Jameis Winston. Before I break down the top quarterback prospects, here are a few things I’m taking into consideration. Every week somebody writes a story quoting an anonymous scout. They’re full of crap. 99% of anonymous scouts are people trying to pass off their opinion as someone else’s. The line between a pro-style offense and a spread is more blurred than ever. Pretty much every college team runs a spread or, at least, something that used to be considered a spread. The Bears and most other NFL teams run a lot of spread concepts. The league wisely adjusted to what the colleges were giving them. All of the top quarterbacks in the draft this year play a sort of spread system and all of them will have to have their reads simplified in the NFL. If their coaches don’t simplify it for them, the coaches will be fired. The Cowboys made things easy for Prescott, the Seahawks kept the training wheels on Russell Wilson for nearly three years and Cam Newton still runs a college offense. How did Adam Gase get Jay Cutler to limit his turnovers? He simplified the offense. That said, there’s never been anyone who has played in the “Air Raid” offense and been a successful NFL quarterback. The player has to show at least some ability to read defenses or make adjustments. I absolutely hate the argument that quarterbacks win games. They don’t. Football is the ultimate team sport. But it’s hard to argue with the fact that the best quarterbacks always seem to be on winning teams. If a guy can’t lift his team to win games in college, is it reasonable to expect he’ll do so in the NFL? Daniel Jeremiah has gotten a lot of play recently for his statistic that only two starting NFL quarterbacks were below .500 their last year’s in college: Trevor Siemian and Jay Cutler at Northwestern and Vanderbilt. Ryan Pace has said a lot about his ideal quarterback. One of the more interesting things was when he spoke about the player’s ability to lift his program. If the Bears are going to take a quarterback with the third pick, the expectation is that he would be a franchise quarterback. Figuring out if teams are winning because of their quarterbacks or if their quarterbacks are winning because of the team they’re on can be tricky. It isn’t coincidence that Oregon and Auburn fired their coaches shortly after Marcus Mariota and Cam Newton left, while Alabama wins regardless of their quarterback. This is impossible to quantify. Some guys have it, others don’t. When I watched Mariota, I felt like I was watching a star. It wasn’t because he was big and athletic with a strong and accurate arm, it was something else. Something nobody has really been able to put into words. When I watched Jared Goff, I felt almost the exact opposite. I want a quarterback who can take over a game and rally his teammates. There are intangibles to the position that are hard to define and even more difficult to identify.